While I was waiting for the starter system for the Dyno (mentioned last issue) I managed to get our K Series VVC project engine up and running. Using the Frontline starter kit to spin it over she was soon fired up and I watched all the dials as the engine warmed up. I was so keen to get mapping that I did not notice that the VVC mechanism was not moving. I managed to get the engine mapped but with a disappointing 143 bhp at a little over 5500rpm. Not right at all. A few checks on the software settings showed everything to be okay so it had to be a mechanical problem with the engine. This was a second-hand unit from a known car and it was working fine when we lifted it out (or so we assumed). Biting the bullet we removed the VVC control section and tried to move the cams. Nothing doing, we ended up removing the mechanism from the gearbox end of the engine as that seemed to be the problem bit. Amazingly we found a piece of the mechanism floating about and jamming the movement. It looks like someone changed the belt and made a mess of it; it can’t have worked for years. The only way to get it all back together properly was to remove the cam carrier and assemble it all on the bench, thanks to some help from DVA Power. 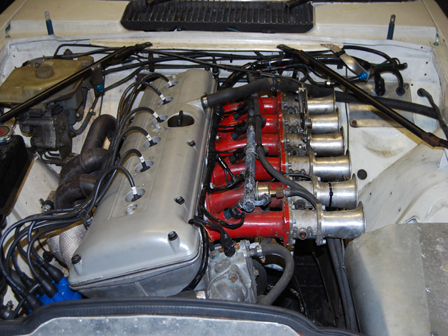 Finally we had a working VVC mechanism and the engine made 158bhp. That power was recorded by allowing the dyno to accelerate at 200rpm/sec which we reckon duplicated the rolling road accel rate (give or take). Out of interest I ran the engine up to peak rpm and then applied load. I let it stabilise and then recorded 163.5 bhp at 7000rpm. Why the difference? The difference is down to something called “slew rate”. I am indebted to my good mate Paul Cronin (sometime PPC contributor) for the info on slew rates and how the Industry tests their engines. 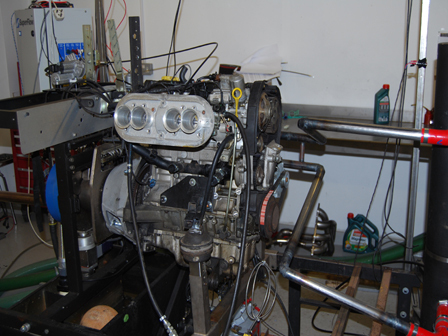 If the engine is accelerating, some of the engine power goes into driving the flywheel, crankshaft, dyno shaft, etc. This reduces the power available at the load cell on the dyno. Once the engine stops accelerating the power goes up because the losses from accelerating the engine are no longer there. In the motor industry the norm is to hold the load until everything has stabilised and then record the power. A step test in fact with about 30 seconds between steps. Last issue I had planned to bring you this test but starter and VVC problems delayed it. I had three exhaust systems for the K engine; the 4-2-1system to fit the K in the Midget, the 4-1 from GBS featured last issue and a full race work of art, long primary 4-2-1. 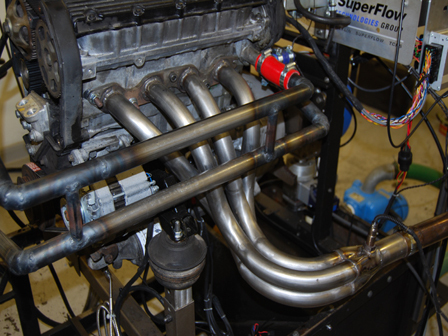 When I say work of art I mean a fabulously constructed stainless TIG welded manifold with polished headers, all superbly blended at the welds. The Frontline 4-2-1 was the manifold that produced 158 bhp at 7000rpm complete with the car’s silencer system. The engine was fully mapped on this manifold as this is the one that fits the car. Next I replaced the Frontline 4-2-1 with the GBS system destined for my Westfield, but retained the frontline silencer system to keep everything else the same. The power was up slightly at the top end with the 4-1 but back in the day the 4-2-1 was reckoned to give more mid-range torque; it didn’t. The 4-1 was just as good across the middle of the rev range and at peak there was only 2 bhp more across the last 1000rpm. Hardly worth worrying about. 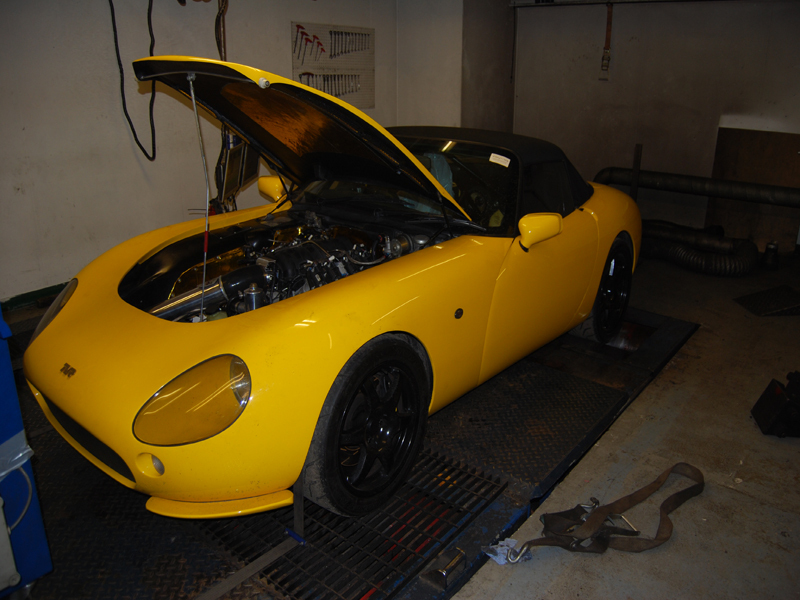 Finally I installed the racer system, long primary 4-2-1 but I had to use an Elise race silencer as the Frontline kit is for a Midget (north south installation) and the manifold was for an Elise racer. I was gobsmacked at the result. Okay, it was a standard engine and I would not have been surprised to see a small gain, or even a small loss, but it was night and day. The race system was hopeless on this standard engine! Torque was down right across the rev range and it never actually peaked. 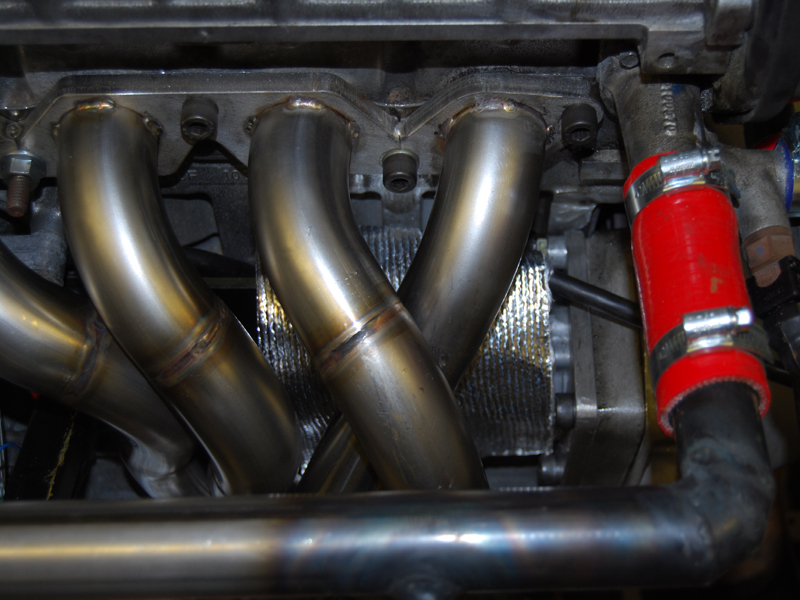 For a standard engine road car this manifold would be a disaster. Back on the rolling road things were going better. 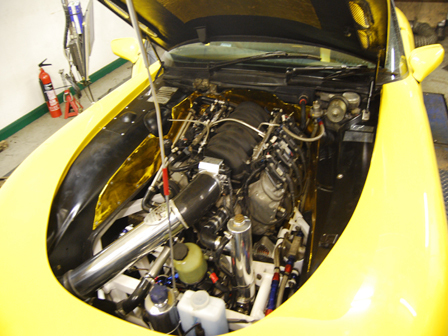 We had the Chris Palmer XJS racer back in and this got back to his best ever previous power. We had a mystery misfire but Karl put the scope on the crank sensor and found a damaged tooth that showed up on the scope trace. He modified the ECU to overcome the problem and all was well. 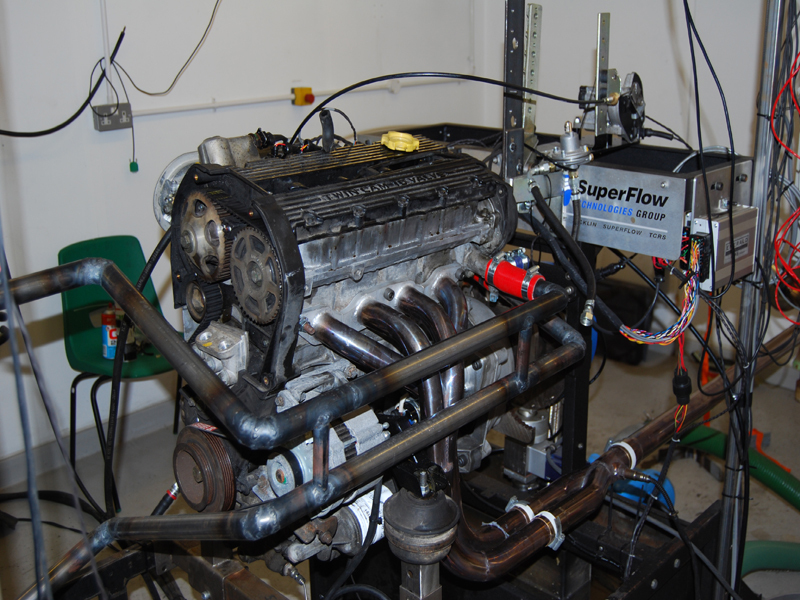 The Duratec engine on the rollers wasn’t doing so well after initial mapping so we had to have a look at the engine. The theory is that the car comes in; we strap it down and map the engine. It seldom, if ever, works out like that. I always start with a cylinder leakage test and if that shows up okay you at least know that the engine is sound. Next we double check for full throttle to make sure nothing has moved. Then I tend to lean towards cam timing. If it is an engine/cam combination that I know I can go straight to those settings, otherwise you are second-guessing in the hope that you can find the best timing before the valves hit the piston! The Duratec does run close as standard but most engine builders cut the pockets for extra clearance when fitting cams or use pistons with bigger/deeper cut-outs. This one was quite a bit out and we made some nice gains from re-timing the cams. We see quite a few TVRs here and I love the V8 sound (not had many six pots here). Just lately the most popular mod is to fit the Chevvy LS engine. This example had an LS3 and it made way over 400bhp on a stock engine. Compared to the engine size that might not be wonderful in terms of bhp/litre but it is still over 400 bhp with torque everywhere in the rev range. Unless you really do want to keep the car original it is the way to go. Rover engine owners have the option of a supercharger conversion (SC Power conversions seem to work well) while the AJP engine owners have the option of going from 4.2 to 4.5 litres. For my money though the LS conversion takes some beating.